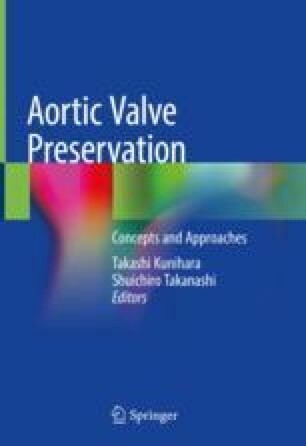 Since the two valve-sparing root replacement procedures of aortic root remodeling and aortic valve reimplantation were introduced, they have rapidly gained attention in recent years. Both types have their advantages and disadvantages, and it is difficult to say which one is superior in general. They are compared in the section “ONE-POINT ADVICE: Experimental Comparison Between the Reimplantation Method and Remodeling Method” (Chap. 17).